Simkar DTD LED™ Collection Very high output LED light in white color, has die-cast aluminum housing with powder coat gray finish. 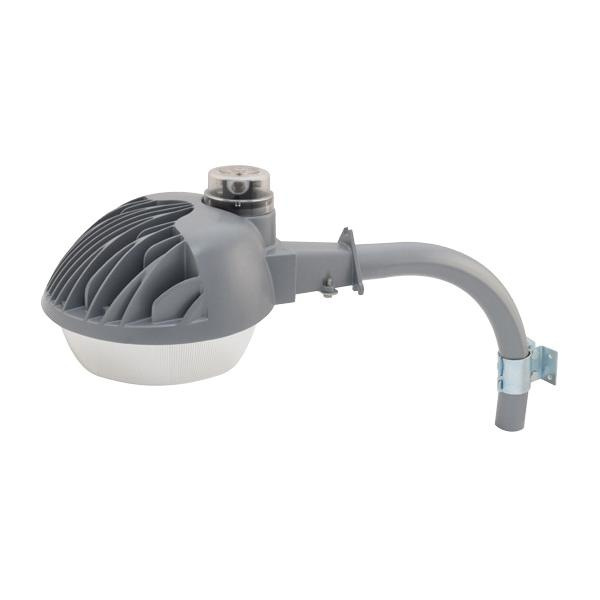 This dusk-to-dawn style light uses 65-Watt, 5000K 75 CRI LED that delivers 6545-Lumens of bright light output. Lamp has voltage rating of 120-Volt AC and current rating of 0.5530-Amp. This lamp has average life of 50000 hours. It measures 1-5/8-Inch Dia x 9.4375-Inch x 7.625-Inch. Wall or pole mountable light includes mounting arm and necessary hardware. It is suitable for area, yard, security and service road applications. LED light is cULus listed.